The Girl of Bronze shares center stage with her famous cousin in two of Lester Dent's most unusual thrillers. When a dying man claims to have escaped from lunar captivity, Doc and Patricia Savage set out to uncover the strange secret of the "Devil on the Moon." Then, Doc's adventurous cousin teams with Monk Mayfair to rescue the kidnapped Man of Bronze in "I Died Yesterday," a groundbreaking tale narrated by Pat Savage herself. BONUS: Captain Fury (a.k.a. The Skipper) and Mara the Leopard Princess confront "Black Cypress Doom." 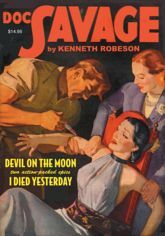 This deluxe pulp reprint showcases the original color pulp covers by Emery Clarke and Walter Swensen, all the original interior illustrations by Paul Orban and Edd Cartier and historical commentary by Will Murray, writer of seven Doc Savage novels.